2 New York Firefighters were killed early Christmas Eve Morning, and 2 more were injured, after attempting to battle a Residential Fire that was set as an apparent trap for first responders. “It does appear that it was a trap that was set for first responders, but the cause or reasons we don’t have at this time,” said Webster Police Chief Gerald Pickering said describing the scene where shots were fired at West Webster firefighters when they arrived at 5:35 a.m to battle the blaze along Lake Road in Webster, which is about 10 miles west of Rochester. The apparent gunman was found dead in an area outside the scene, but it’s unclear if he was killed with a self-inflicted gunshot or if it was from a weapon from a police officer who was chasing him. Firefighters Mike Chiapperini, also a lieutenant and public information officer and Tomasz Kaczowka, he’s a West Webster firefighter and 911 dispatcher were killed in incident, Pickering said. One can only wonder why this year is culminating to an end riddled with gun violence and shootings. People are losing their lives senselessly, and in this situation, those who lost their lives are men who dedicated their lives to the act of heroic service. Chiapperini was described by Pickering as lifelong firefighter who started with the department’s explorer program and has about 20 years of experience. Kaczowka was a younger firefighter, he said. West Webster firefighters Joseph Hofsetter and Theodore Scardino seriously injured and are at at Strong Memorial Hospital with gunshot wounds, a hospital spokeswoman said. She said at at noon press conference, that Scardino had had injuries to chest and lungs. Hofsetter was injured in pelvis. Pickering said that one of the injured firefighters made his way across a bridge to get to safety. The other three had to be rescued by police who arrived on the scene. “These are volunteers who get up in the middle of the night to fight fires, they don’t expect to be shot and killed,” a tearful Pickering said at the press conference. No details were released on the gunman. Pickering said he was found dead at the scene with the apparent weapons used in the shootings. The morning scene was described as chaotic as police and firefighters dealt with an immense blaze as well as gunshots, local news station WHAM-TV reports. The station also reports the firefighters who are involved are volunteer firefighters. “I’m not aware of anything like this happening in Webster, obviously not a firefighter being fired upon,” Webster Fire Marshal Rob Boutillier told the Democrat & Chronicle. Pickering described Webster as resort lakeside community that is quiet and usually peaceful. There at least four houses that have been damaged by the fire along Lake Road, WHAM-TV reported. Firefighters had to leave the scene and stop battling the blazes while police secured the scene. They are back to fighting the fires, the station reports. They continue to battle the blaze. News of the deaths spread quickly through social media. what the hell is wrong with people?! Jimmy, love the avatar pic of SNOOPY in a Browns helmet, too funny. It takes an unspeakably cruel person to murder folks that are there to save lives and homes. What’s wrong with people? They used to attack the ambulance and firefighters in Detroit. Usually the situation was a hit over drugs and the fire was to destroy the evidence. The early responders were prevented from helping the victims. My buddies father used to be the chief at a firehouse in Jersey City. He said their guys got shot at when responding to fires in bad areas. Unfortunately, this kind of pathetic behavior is not new. Such sick people in our country. Very sad. As a former volunteer ff/emt from Honeoye Falls,NY fire dept and who had training at Webster fire dept, may my fellow brothers rest in peace. People volunteer for one of the most dangerous jobs that help and protect others, and get shot at. I salute every policeman and firefighter in this nation. 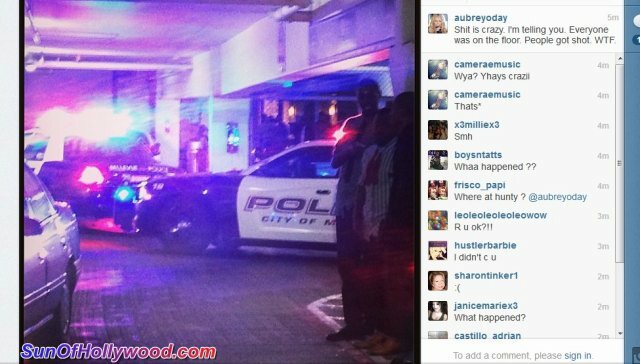 Aubrey O’Day just got caught up in a scenario that our nation is becoming all too familiar with… another Shooting !! Aubrey was chillin at a club in Bellevue, Washington called Munch Bar with her friends, Krystal Bronson and Angela Herrick, just after enjoying the Seattle Seahawks vs. San Francisco 49ers game… When all Hell broke loose in the club she was partying in. 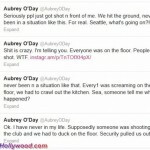 Aubrey took to her twitter sharing with the world about the hectic life or death scenario, telling her followers that she witnessed people getting shot right in front of her, and security pulled her out while having to crawl out of the kitchen. Sources say at least 3 people have been shot, and the entire club has been shut down with all patrons being questioned and investigated by police, Aubrey included. All club patrons are currently kept in the club’s parking lot for questioning. The details are developing, and it looks like Aubrey and her girl are gonna be there a while… But with all the Tragedy that has been hitting our Nation, all we can do is Thank God that Aubrey is safe. Our prayers are with all who were involved. A long night is small time compared to a last day.